Is Trem One Australia's Best Lyricist? If you’re looking for an artist with a 2017 industry standard sound, look no further than Bando Wavey, from New Orleans, LA. Bando Wavey stops by The Source today, to lace us with a Wavey Wednesday exclusive, his newest mixtape ‘Made In NOLA’, featuring $leazy EZ, Teezy Baby, and Young Lyxx. On this tape, you can hear Bando float on beats that mirror those most successful in today’s musical landscape. It seems as though Bando Wavey has found a pocket in the game, and he’s working towards mastering it. “Made In NOLA” is a brand that Bando has made extremely popular, first exclusively in New Orleans, and it has now since spread across the country, and the world to be honest. With In NOLA We Trust gear flying off the shelves of local boutiques in New Orleans, it seems as though Bando Wavey is primed for a great run for the remainder of 2017. 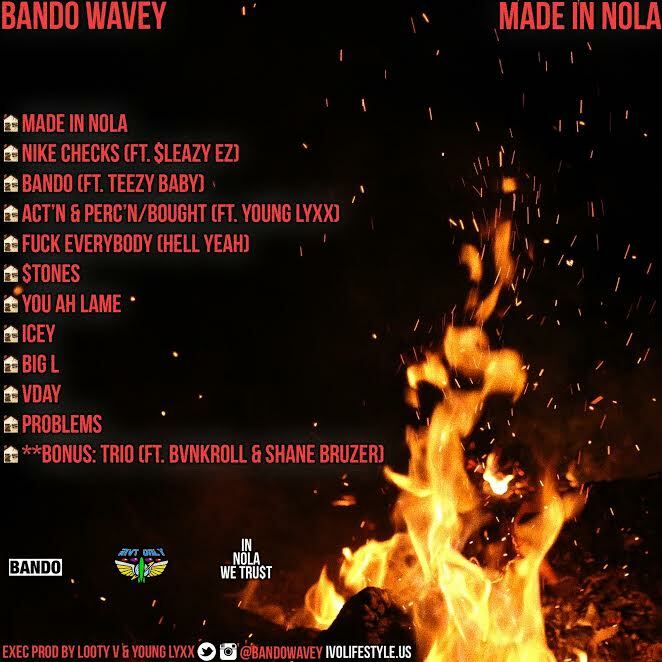 You can check out ‘Made In NOLA’ in its entirety on Bando Wavey’s soundcloud below.